 Which of these Nian icons, is your inayopendelewa au do wewe like more? Choose your inayopendelewa ikoni of Nina. The Vampire Diaries co-stars mgawanyiko, baidisha up back in May 2013, after three years of dating, and joked about the break-up during the January 8 awards show. 1. Congrats again!How do wewe feel as the Nina Dobrev FOTM for September? 1. How do wewe feel about being the Nina FOTM? I'm sooo happy that I even can't express myself! It means the world to me because I really adore this spot , it feels like nyumbani to me, it's my favourite place here and it's all because of the mashabiki here.You're so passionate that it means a lot to me just to be a part of this spot and to be a FOTM is such an honour that I'm so happy and grateful,and overwhelmed... THANK YOU! 2. How would wewe rate Nina as an actress? Is she your favorite? 1. How do wewe feel about be the Nina FOTM? Did wewe want to win? Dillon Casey who played [obsessed with Elena, vampire] Noah, on "The Vampire Diaries", co-starred with Nina on the 2007 made for televisheni movie, "Too Young Too Marry." They played husband and wife. Nina watched all awali seasons of "Degrassi," before auditioning. She favored Craig's character and went out for the part of Manny. She was later called back to portray, Mia Jones. 2. Out of all of Nina's characters that wewe know of, if another celebrity that wewe know could replace any of them, which would wewe think they should replace? Which part do wewe think Nina would suit best that another celebrity has? As a member of varsity team, Nina was serious about mpira wa wavu in high school, but now the sport is just a fun way to break a sweat when she's hanging at the beach, pwani with friends. "A lot of the girls sit it out and watch in a lawn chair, but I'm always out there with the boys!" The Vampire Diaries nyota has a super-strong, totally hot body! Nina Dobrev (born January 9, 1989) is a Bulgarian-Canadian actress who plays Elena Gilbert and Katherine Pierce on The Vampire Diaries. She has also played Mia Jones in Degrassi: The inayofuata Generation and has starred in a few movies. 1. She’s zaidi than a triple threat! Not only does Nina have the triple threat abilities – singing, dancing, and uigizaji - down pat, but she’s also a former model and gymnast! She even represented Canada internationally in gymnastics! 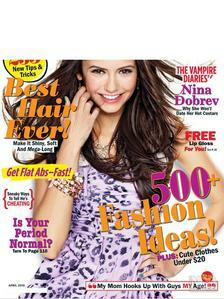 What magazine is Nina on in this cover?